If Reid studied his history a bit more closely, he might realize that -- for all of its racial baggage -- Illinois is the only state in the Union that has twice elected African-Americans to the US Senate over the last, oh, hundred years or so. Soon-to-be Pres. Barack Obama may actually long for the days of Bill Clinton's divided government. So far, he hasn't exactly gotten a great boost from his supposed "friends" in the Democratic Party. Two Democratic governors -- including one Obama had nominated to be Commerce Secretary -- find themselves under federal investigation. And, well, Sen. Majority Leader Harry Reid (D-NV) is almost making former majority leader Trent Lott -- a Mississippi Republican -- look like a paragon of racial progressiveness. Yes, U.S. Rep's Bobby Rush's explicit use of the race card last week following Rod Blagojevich's appointment of Roland Burris to replace Obama in the Senate was pretty bad -- but hardly unexpected. After all, Rush is a former leader in the Black Panther Party. But Harry Reid's pre-indictment counseling of Blagojevichnot to appoint either Rep. Jesse Jackson Jr., Rep. Danny Davis or state senator Emil Jones -- all African-Americans -- must be horrendous if you're a Democrat. It actually gives credence to Rush (and Burris') charge that the U.S. Senate is a racist institution. 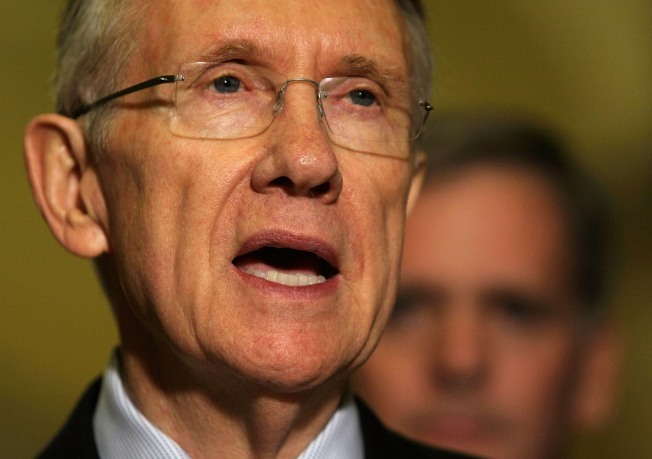 Coming on the heels of Reid warning Burris that the Senate would block him from being seated -- and essentially treat him as a second-class citizen until Blagojevich was either removed from office or his power to appoint was curtailed -- made the Democrats look like they're reverting to their pre-'60s role as the party of segregation. Now, Reid may have been reading the political tea leaves correctly: He truly believes that none of those men can win an election statewide. However, if Reid studied his history a bit more closely, he might realize that -- for all of its racial baggage -- Illinois is the only state in the Union that has twice elected African-Americans to the US Senate over the last, oh, hundred years or so. So, who's to say that not one of those three (Jackson Jr., Davis or Jones) couldn't win the office fair and square? Geez, if Carol Mosely Brauncould win a statewide election and get to the Senate, anyone can. Robert A. George is a New York Post editorial writer. A one-time aide to former House Speaker Newt Gingrich, he also blogs at Ragged Thots and occasionally dabbles in stand-up comedy.